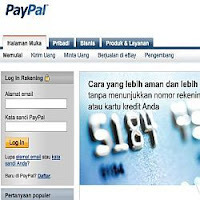 Recently PayPal Ltd. have been kind enough with our country and maybe with others country from south east asia too. After some time ago PayPal share US 100 $ money through PayPal Wishlist at Facebook, now PayPal is starting to give us ease of maintenance of the account verification. PayPal accept verification methods entirely new, namely through local bank accounts. So, if you have an account at the bank, you can have a verified PayPal. How cool is that? No need to spend money to buy Virtual Credit Card (VCC) and wasting your times or dizziness committee the annual fee of the credit card. How to do that? 2. Click Profile - Add/edit Bank accounts. 3. Enter the name of the bank and your bank account number. 5. After you submit routing code, you'll need to wait 1-3 days (my friend experience is 2 days) PayPal will send a double-digit deposit into your bank account, this double-digit deposit that will be used for further confirmation. 7. Now, login to your PayPal. 8. If this is the first time, you will be asked security answer. 9. Click the Get Verified link. 10. Click the Confirm Bank Account link. 11. Enter the 2 digit value that PayPal sent to you , There is 2 forms, enter the appropriate values . Examples: 17 and 21. 12. If wrong, maybe the opposite, so back it. 13. Congrats your PayPal now has been verified. Well, now after this verification, you can use all the facilities properly PayPal began to send money, receive money, withdrawal, etc. But if the balance is empty, then you have to fill them because PayPal can not take it self from your bank account. These also answering some of those concerns who fear that PayPal will take the money in our account. which is impossible.